The Schindler 3100 is an MRL specifically designed to replace hydraulic elevators for the low-rise commercial and multi-unit residential market in the U.S. It is designed to allow for more usable building and design space by eliminating the need for a machine room or a control closet. 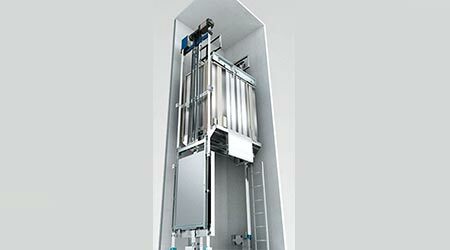 It fits seamlessly into the footprint of a hydraulic elevator design, yet provides the smooth, quiet operation of traction technology. In addition, Schindler 3100 cabs are on average five percent larger than the average MRL cab. The system is delivered to the building site in one complete shipment allowing accelerated lead times and quick installation. The Schindler 3100 offers a sleek Italian cab design and finishes to fit any style or building décor. In addition, each Schindler 3100 is equipped with Schindler Direct, a proactive maintenance tool that monitors the system 24/7 and helps return equipment to service up to 22 percent faster than traditional troubleshooting methods. A potential outage can be remotely noted and locally addressed before the building is affected.